You can support our work as a sanctuary for individuals facing deportation with your charitable contribution. Clayton Memorial Unitarian Universalist Church meets on the 1st, 2nd, 3rd and 5th Sundays of each month. We do not meet on the 4th Sunday. Services begin at 11:00 a.m.
On the first Sunday of each month we hold an Eatin’ Meetin’ (a potluck lunch) following the 11:00 a.m. service. Visitors are invited and encouraged to stay to enjoy the food and fellowship. You need bring nothing with you other than a healthy appetite. We also hold services to recognize special occasions and events. CMUU is recognized by the UUA as a Welcoming Church, and we strive to be welcoming and warm to all. Explanation of the Lighting of the Chalice — A flame within a chalice (a cup with a stem and foot) is a primary symbol of the Unitarian Universalist faith tradition. Many of our congregations kindle a flaming chalice in gatherings and worships and feature the chalice symbol prominently. Of that flame which burns in each of our hearts. The two become one, belonging to each other. The warmth of community, of congregation, of city, of nation. And join with others to light the way to a good world community. We must remind ourselves of who we are, and we must know who we are. We are Unitarian Universalists, friends, visitors, seekers. Explanation of the Opening Anthem — The anthem is a time for musical deepening. If there is a choir, they usually sing this anthem accompanied by the Music Director on piano or organ. Generally, the opening anthem complements the sermon of the day. Some congregations use the same opening anthem at every worship service, which is similar to a liturgy in Catholic or Lutheran services. At Clayton Memorial, the Opening Anthem is usually a song of welcome to the service. Explanation of the Responsive Reading — Responsive readings help the congregation participate in readings related to the topic of the service. At Clayton Memorial, we select responsive readings from the back of the hymnal The readings come from a variety of faiths and secular sources. We also find longer readings that are related to the sermon topic and make them into responsive readings. When not in the hymnal, the reading is often printed in the weekly bulletin. Explanation of Unitarian Universalist Hymns — There are 2 hymnals used at Clayton Memorial: the grey hymnal, Singing the Living Tradition, with more contemporary UU hymns, and the red hymnal, Hymns of the Spirit, with more traditional Universalist Hymns. There is another contemporary UU hymnal published by the UUA, but we do not currently have this hymnal. Hymns draw from many faiths, including Christian, Jewish, and Native American. Some of the hymns we sing have familiar tunes from well-known hymns with the lyrics tailored to Unitarian Universality Principles. 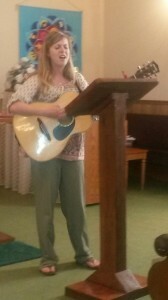 Some of the hymns were written specifically for UU Services. Other sources of music from our service are popular secular songs, past and present, that are related to the sermon topic. The song we will sing today, number 67 in the gray hymnal titled We Sing Now Together, has the same music as the traditional Christian hymn We Gather Together, but the lyrics have been tailored for UU beliefs. 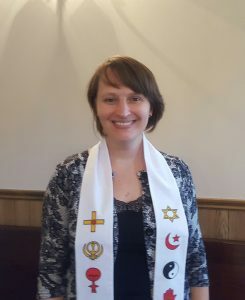 Explanation of the Unison Affirmation — Unitarian Universalism is a faith that comes from beliefs of many world religions. Each person is on an individual spiritual path. Stating a Unison Affirmation is a way for members of the congregation to focus on the fundamental beliefs that are shared. Saying this in unison is reminiscent of reading creeds in Catholic and Lutheran services. While there are unison affirmations, many congregation members like the familiarity of one or two readings throughout the year. This unison affirmation is printed on the front of the weekly bulletin. We affirm that love is our greatest purpose. Accepting one another is the truest form of faithful living. The search for truth is our constant star. And to live out our Unitarian Universalist values every day as a beloved community. Thus do we covenant with each other and with all that is sacred in life. Explanation of Sharing of Celebrations and Concerns — Joys and Concerns is more than just time set aside in our service for people to share or speak out or make announcements which they forgot to get in on time because we have no other adequate outlet for this. It is an expression of how we understand the world and our relationship to it. It is a ritual expression of our core beliefs. It is a visible representation of the interconnection and interrelationship that we hold as essential to the meaning and structure of human existence. It is a symbol for the living presence of the source and meaning of life among us. Placed in the context of a religious service, held in a sanctuary, surrounded by religious symbols, this time takes on power beyond what is said or done. By placing a stone in the water as you speak, you physically represent the powerful meaning found in this time of our service. In this act you are offering these moments of your life to the larger community of faith, offering them that your sorrow may be held with sweet compassion, offering them that your joy be embraced with delight equal to your own. Perhaps even more important, you need not speak to engage in this ritual. Simply placing the stone in the bowl can be enough. Explanation of the Benediction/ Extinguishing of the Chalice — The benediction is a short quote or blessing often said at the end of a church service. The purpose of a benediction is often to bestow blessings on the church congregation or to ask for guidance and mercy in the coming days. It is a reminder to those in the congregation that although the service is over, that we carry our spirituality with us when we leave the service. Though the benediction usually marks the end of a service, it is just as much a part of the worship as the sermon or hymns. Where our deepest hope is to be of service to a hurting world. And our hands toward the work of peace.